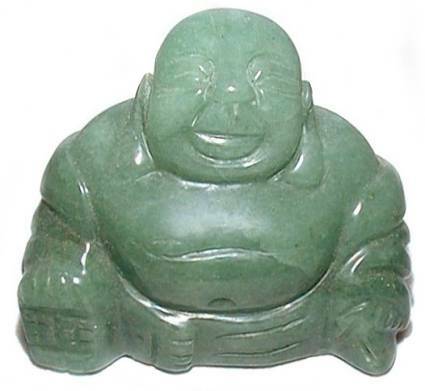 Happy Buddha carving in translucent Aventurine. Aventurine is a healing stone that fosters integration of the emotions which enhances creativity, clarity and a pioneering spirit. The Happy Buddha is a frequent Feng Shui cure, said to bring wisdom, prosperity and happiness. Aventurine fosters integration of the heart chakra, enhancing creativity, clarity and augmenting the pioneering spirit. "Aventurine reinforces one's decisiveness, amplifies leadership qualities and is a willing participant in instinctive action."